A Morehead City woman trades in the boring for the creative. Lou Wilson has a disarming, if not slightly disturbing, way of describing herself. Learn a little bit about her, and the reasoning behind Wilson’s half-joking self-depreciation comes into focus. For it was not long ago at all that Wilson was spending 70 hours a week crunching numbers as a CFO/controller for major corporations. After rising quickly to the post of divisional controller by the age of 25, she spent 23 years in accounting as the left side of her brain put in overtime. “Hated it for 23 years,” the plain-talking Wilson says. Now she’s doing what she loves, and the drastic career change has been like her: very atypical, indeed. Wilson, a 53-year-old Morehead City resident, made the almost unfathomable, 180-degree, left-brain-to-right leap from accountant to artist. 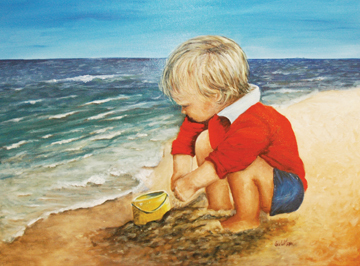 Wilson is an artist-in-residence of sorts at Arts & Things, the Morehead City gallery and art supply shop she owns and operates with her husband. Despite no formal training and a background more suited to poring over figures than drawing them, Wilson works in a variety of media while sharing her talent and acquired knowledge with the small weekly class she teaches upstairs at the store. Since she started as an artist, she says, on a whim in 1987, Wilson has gone from a job that didn’t quite fit her unique personality to a passion that has set her free. And she believes anyone can do it. That’s the artist talking. The accountant would have it the other way around. Wilson’s unlikely transformation came about gradually, as she felt less enthused about balancing books and more interested in balancing color. In a roundabout way, she owes what she’s doing today to the fact that dogs, to some landlords, don’t always make the best tenants. In 1994 Wilson’s husband, Porter Wilson, sold his residential building development business in Northern Virginia, with plans to retire to North Carolina. He had been to Charlotte on business and figured they’d eventually settle there. Instead, he had a friend in New Bern and decided to move there, renting a home until time to buy. But with the couple’s two large dogs in tow, finding rental property in New Bern proved difficult. 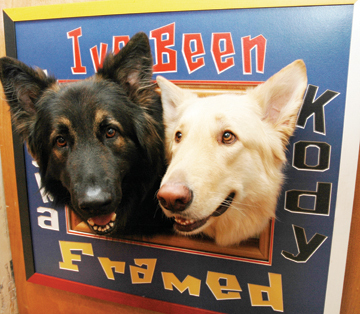 They happened to find a dog-friendly place to rent in Morehead City, and they took it and never left. Their retirement had begun. Life without a career, though, didn’t suit the Wilsons well. As Lou took a year off to pursue her fairly new hobby of painting, Porter worked on his golf game. Both were bored silly. Soon Lou discovered that it was difficult to find art supplies in the area. So, again on a whim, she says, they opened an art gallery, framing and supply shop at the corner of 8th and Evans Streets. She had always wanted to own a small retail business, and this was the perfect convergence of a pair of dreams. She had already been framing and matting her own works out of the basement of their home. The plan was to run the shop and put an easel in the corner so she could paint. But the store became too consuming for that. After four years, when they had expanded as much as they could on the property, the couple decided to relocate. They built the store’s current 4,500-square-foot building and reopened in 2000. 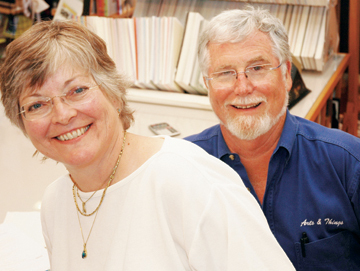 In addition to art supplies and framing, the Wilsons sell the work of about 35 local artists — including that of Lou Wilson — and several from around the world. Pieces from Australia, Germany, Canada, Russia, Poland and Italy are among the diverse paintings that line the walls under the building’s high ceiling. At the shop, the Wilsons use their backgrounds to complement each other as businesspeople. Porter Wilson’s experience as a business owner and his growing knowledge of art go well with his wife’s grasp of the artistic process. Her accounting expertise is a nice bonus. On the second-story loft, Lou Wilson teaches her class to a group comprised mostly of retirees who found themselves similarly bored. The class is limited to eight or nine people so each student gets proper attention. Many students come to Wilson without ever having tried painting. Some are shocked to discover that they do, in fact, possess artistic ability. Several of her students have gone on to win awards and sell their works. “They find they can do this, and they can do it well,” Lou Wilson says. “Their whole feeling of self and everything else is so wonderful. The teacher dabbles in a little bit of everything. She’s gotten into oil painting in the past year after working with acrylics, pastels, color pencil, graphite, charcoal and watercolor. She loves doing portraits, which is how she got serious about painting in the first place. Wilson went out one day and bought some pastels — just for fun — and set out to reproduce a photo from a magazine. The result, a detailed close-up of a bearded Afghan man, was the first painting she ever did. A copy of it hangs, taped unceremoniously to a white beam and dated “11/87,” in the store’s loft. Friends who knew Wilson had begun painting as a respite from accounting would call her and commission portraits of their pets. That led to more commissions, so many that she stopped taking them so she could paint what she wanted. Besides the Afghan man, both Wilson and her husband have a favorite work of hers. It’s a portrait of their granddaughter sitting in a finely detailed field of grass, wearing a yellow dress and gazing past bright red flowers. A defining moment in Wilson’s career was when the young child saw the painting and recognized herself. “That was pretty cool,” she says. Porter Wilson, duly noting his bias, says he’s been amazed at how his wife has discovered and nurtured her talent. Accountants, by nature, see trees where there is forest, and the accountant in Lou Wilson still surfaces from time to time. It took her a year of trial and error before she could teach herself to paint a tree without focusing on the thousands of leaves. The challenge, she says, is shifting back and forth between her accountant’s mind — and its proclivity for seeing excruciating detail — and her artist’s eye, which sees the forest first. “I thought I would be stuck in accounting for the rest of my life,” she says, breaking into laughter at the thought of her former life. “I’m getting more and more right-brained as I go.